Kids believe only what is taught to them. Last night 28 kids, most under the age of 18, were arrested on Chicago’s Mag Mile for intimidating people and another bunch were arrested following an assault on a woman who asked that the kids put out their cigarettes. I do not believe that the youngsters were engaged in civil disobedience demanding that CPS keep failing schools open, nor were they concerned with the plight of LGBTQ citizens. From this same edition of the paper, the Opinion section of the Chicago Tribune was thick with opinions on both issues as being fundamental to life on our planet. The school closings? I see them them as part of the overall Rahm Plan to shrink the City of Chicago ( services) down to an Urban Center. Likewise, the abhorrent incivility tolerated on Chicago Transportation systems by the Mayor and CTA Boss Forrest Claypool is a component in this plan. Why else would a Mayor not do his utmost to light a fire under his appointee to interdict such behavior and provide the necessary police officers at his disposal to correct the situation? Answer. It is not part of the Plan. The Plan includes a $ 100 million dollar loan to gussy up the River Walk, but not seek a loan to hire more cops. Back to the schools. The closed schools, the largest school closing in American history, are real estate. 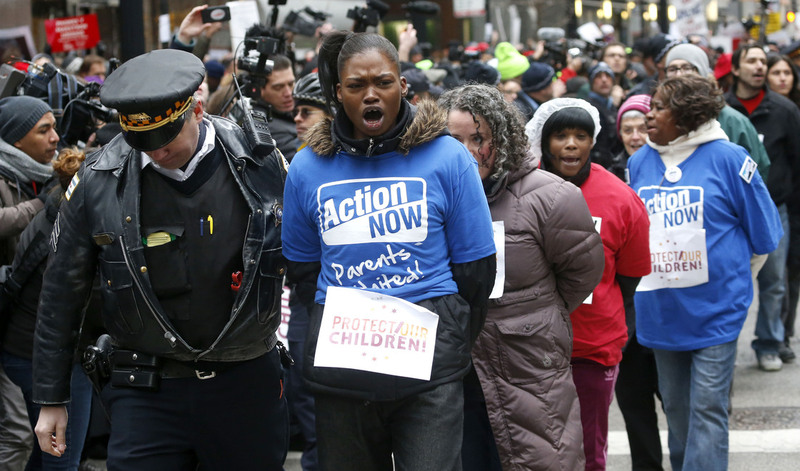 Take a look at who is protesting the school closings ( CTU’s Karen Lewis & Jesse Sharkey) – they worked with Mayor Emanuel to engineer the closings. Their Red-shirted Dragon Dance through the Loop last week provided Bill Ayers and opportunity to be described as an “elementary school expert’ in the Chicago media, as well as swell venue for SEIU to play civil disobedience for cameras without the possibility of arrest. Tickets were issued. For the last thirty years Bill Ayers* and the well-camouflaged Mike Klonsky have trained a generation of radicals who now control Chicago Teachers Union through CORE. Chicago Public Schools have nose-dived deeper into the tax-dollars from the moment the Annenberg Challenge was boarded and looted by Bolsheviks and took command of the Education Department at University of Illinois at Chicago. Here’s a challenge. How many UICC disciples of Billy Ayers are CPS teachers? The idea of schools has been entombed in a cave behind the boulder rolled by Ayers and Klonsky. Schools should reflect the neighborhoods they serve. Catholic schools most certainly do just that and graduates of Catholic schools, black, brown and white manage to avoid massive arrests on Mag Mile and intimidate passengers on the CTA. Ayers and Klonsky made small schools (cadres) wholesome to lazy and not very bright editorial boards and columnists. Schools fail, because they are supposed to do just that. Chicago is a Catholic city. No matter how much Eric Zorn, Mary Schmich, Neil Steinberg, Carol Marin, Clarence Page, Dawn Turner Trice, or WTTW try to obscure that fact, Catholics rub up against Baptists, Unitarians, AME, Lutheran, Jewish, Greek Orthodox, Dutch Reformed and atheist neighbors. Schools should reflect that fact, but they are not allowed to do that. Christ died on Friday, busted Hell’s prisoners out on Saturday, and triumphed over death today, when he rolled back the big rock. The big rock blocking real schools and the idea of a school is still wedged in pretty deep. Kids are taught what to fear and given no means to conquer fear. Behavior reflects what people are all about. *“Elementary education expert and professor Bill Ayers — who has sparked controversy on the national political scene with his ties to President Obama — was in the crowd in support of teachers. Hillary Clinton’s closest advisers haven’t yet decided on whether to set up a super PAC on her behalf, the must-have accessory for the modern campaign. But that isn’t stopping her adoring fans from doing it on her behalf.